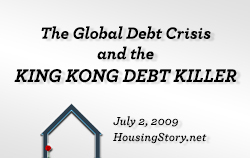 HousingStory.net predicts a nine percent fall in property prices nationwide in 2010. 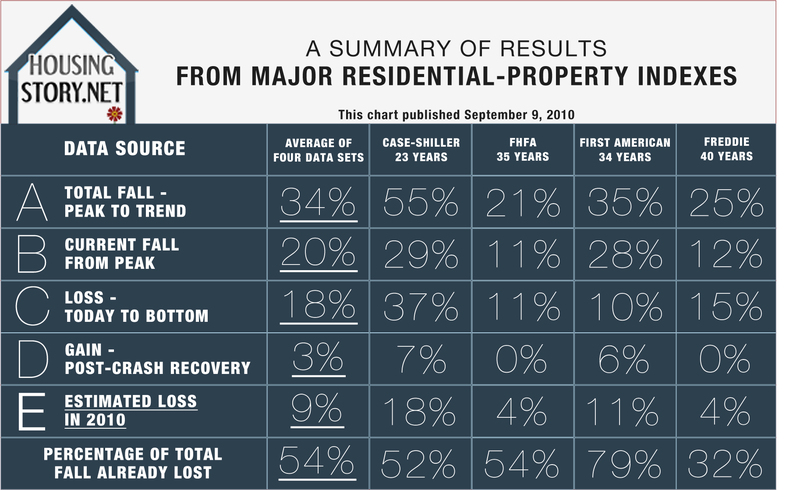 HousingStory.net surveys and averages the data of four major property price indexes including Case-Shiller, the Federal Housing Finance Agency (FHFA), First American, and Freddie Mac (Please see the results immediately below.). All charts are based upon actual data through June 2010. Click image for full-screen review of data. Our projections are based upon the assumption that values broke into bubble gains starting in 2000. We project a pre-bubble trend using values predating 2000 and going as far back as possible in each data series. 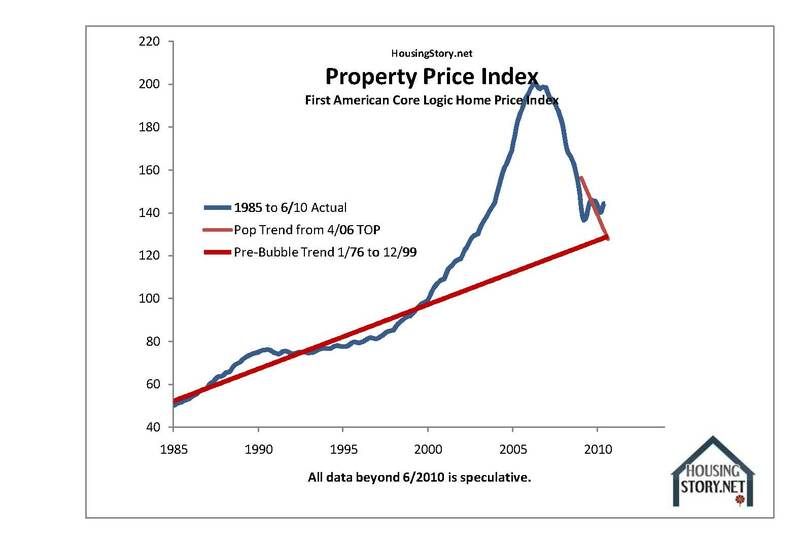 We then project a second trend: It follows prices from the fall of the height of the boom. You will understand this method as soon as you view any of the forecast charts (Please see Case-Shiller immediately below. The other three price charts follow this post.). You will observe in the charts of the four data sets remarkable likenesses in the nature of the rise and fall. While the pattern is the same in the rise and fall, the numbers which describe those changes are very different from one data set to the next. We are estimating, for example, a total fall in prices of 55 percent nationwide based upon Case-Shiller 10-City, but we estimate a fall of only 21 percent using FHFA. Case-Shiller remains the bearish measure today with values down 29 percent from the peak. FHFA says prices have fallen only 11 percent. 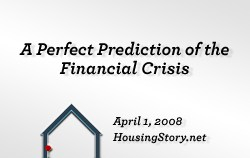 A stat which may be of great interest is the prediction by the average of the indexes that our fall in prices is only half-way accomplished – a forecast which, if true, will elicit fear in the hearts of homeowners, buyers, bankers and government officials. A natural fall-back in prices is a matter of the highest gravity to the Federal Reserve Bank and the Treasury and to current and future homeowners. The federal government has massively intervened in the housing market. It funds nearly 100 percent of new mortgage loans originated today. 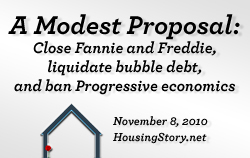 Fed and Treasury are attempting to preserve bubble values for homeowners and save mortgage investors. 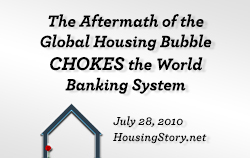 Absent government intervention, housing prices would have fallen 50 percent or 75 percent by now. Probably one-of-three or one-of-two mortgages would be in default. Global depression would surely have followed such a fall. We believe an ambitious destruction of credit-bubble debt investments would and will allow the economy to roar back to life. This camp says the creative destruction of debt following a credit bubble is the silver bullet, the radical magic, the Holy Grail, the gift of life. It is an open question whether the fall in prices has ended. In the aftermath of a great American property bubble which blew up inside of a great worldwide property bubble, the Fed may meet its match and win defeat. Only then can we slay the deadly debt-strangled monster we inhabit today. 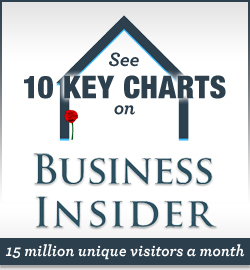 Thank you for carrying or quoting from the story to The Automatic Earth, Business Insider, CNBC, Implode, Patrick.net, Seeking Alpha. Please see previous forecast posts from January 2010 & April 2010. Michael David White originates mortgages in all 50 states. I am also of the camp that says supporting housing prices is the wrong way to go. 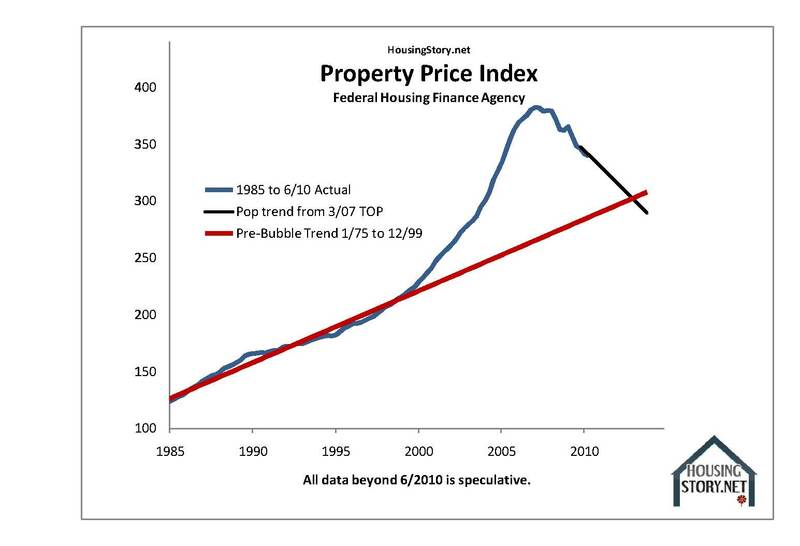 Everyone seems to think that the decline in housing prices / values is what caused our current economic problems. 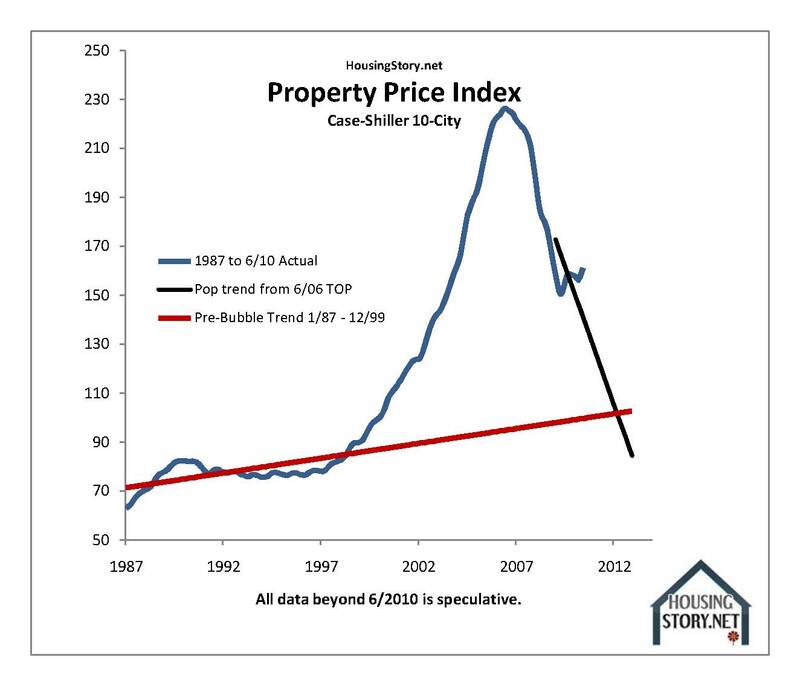 It seems to me that it was not the decline in prices, but rather the preceding excessive increase in housing prices that put us in this situation. 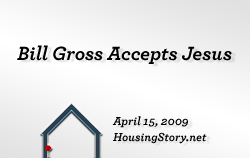 Home prices had become artificially elevated based on the underlying, inappropriate and unsustainable lending practices allowing demand to become artificially elevated. It is inevitable that there must be a correction in price once demand returns to a normal, sustainable level. Therefore, the government attempting to prop up housing prices by artificially increasing demand is just delaying the inevitable (and costing taxpayers billions in the meantime). Like most things, houses are worth what someone is willing to pay for them.. in my lifetime, a home has become just another commodity, and there in lies the rub.. on average, it costs about 100.00 per square foot to build a home, (+cost of land), that is without the owner picking up a hammer, less if you are handy.. having said that, the premiums that have been gained or lost over the years have nothing to do with the home’s inherent value and everything to do with, sentiment, hype and absurd expectations.. so, i for one try to keep this reality in perspective when i consider the real estate climate. i wish others would too. i do lament the above conclusion, i personally have owned many houses over the years, but because i am in the demographic of “home as commodity” generation, i have never owned a home… if i had, the price would not concern me and i would not be panicking every time i read that the value has suffered, nor would i rush to purchase at absurd prices when i read that prices are climbing.. unfortunately, this is not how the “Excited States of America ” conducts itself, and this disturbing behaviour seems to have spread around the world. A little perspective and common sense would do more good than anything politicians, bankers or economists could come up with, but then all these analyst’s and commentator’s jobs would be unnecessary. ah Reality…. thanks for the amusement… good luck to all…. In a nutshell, applying your estimates, I get a current market value within $700 of the current asking price. Pretty good! If your estimates hold true, this house is really worth about $970K (I still think that is overpriced but time will tell). I love this website. 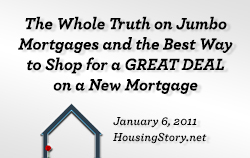 But, in the higher end markets the reality is a lot different than some of this hype. In our Richmond, VA neighborhood we had four homes close in less than a month on the market all for asking prices, which was approx. I million. I am not saying spec houses in the Nevada desert are not dying on the vine, and I am also not saying that LA and Connecticut homes that were once going for $24 million are not cut rate at $15 million. What I am saying, is that in solid neighborhoods where financially conservative people continue to slog away at the same jobs they had five years ago, house prices are holding and there are absolutely zero screaming bargains. The majority of this bubble was out of control lending, and all of America is paying for it. 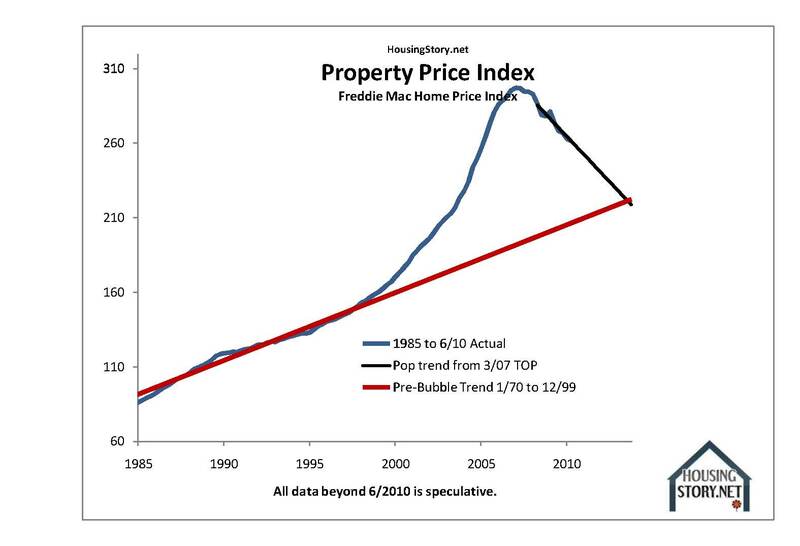 I think it’s going to happen in your neighborhood – just a matter of time – remember we are still only about 3 years out from peak – if prices trend lower (which they will by staying flat) for another 4 -7 years and employment doesn’t pick up, then i think prices could drop another 10 – 25%. National aggregates are fine for people doing macroeconomic analysis and predictions. But anyone wanting to know what house prices are going to do in their own local area, had better look at the stats for their own local area. There are huge disparities between different areas in the USA, that aggregates conceal. Basically, the bigger the “rise” in your area, the bigger the “fall” HAS to be. Then there are the economic basket case areas like Detroit. But if you live in one of the “flat line” areas you probably don’t have to worry so much about house prices dropping. Sorry I keep going on about this, but huge mistakes of policy right up to the top of the Federal Govt are being made because this is so little understood. If prices were to drop further, intervention by the current administration is likely. 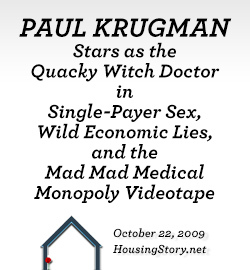 We still own Freddie Mac and Fannie Mae. If the government continues to drive down mortgage rates, then offered an instant reset of all existing mortgages held by F&F with an option to extend the length of the loan, this would slow foreclosures, support housing prices and stimulate the economy. The administration still has ammunition to fire to battle this recession. Would be helpful to see the compounded annual return percentage value being used for the pre-bubble trend line. Looking at it, it looks like the trend was ~6%? Is that accurate? Excellent presentation. 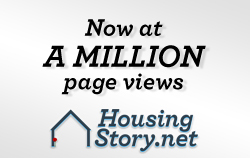 These projections meld nicely with the recent notification that HUD has lowered their FHA lending standards. I suppose it’s difficult to unwind a bubble when you exclude a large percentage of the population who can’t qualify to buy the underlying asset. 2) yesterday FGMNX (Fidelity’s Ginnie Mae Fund) plummeted like a lead sinker – 26 cents in one day! This is unheard of. Two or 3 (possibly even 6 at worst) cents in one day may occasionally happen, but I do not think that the fund has ever in its multi-year history plummeted by 26 cents in one day. Today it lost another 3 cents. By itself, this wouldn’t be curious, but added to yesterday it’s a significant chunk of one-time drop. Do you know of a concrete event that could have precipitated this? I have searched and searched, and the media (including financial internet sources) is silent as crickets. Alternatively, do you think this portends the market’s ANTICIPATION of what it sees coming shortly down the line: either an assessment of Ginnie Mae’s soon-future failure, an assessment of government bond failures in general, or an assessment of bond failures in general – both government and corporate/private? Thank you. I look forward to your answer.